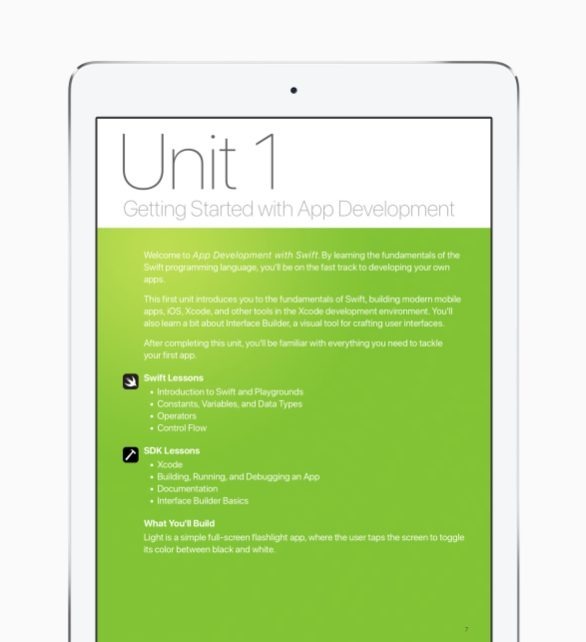 The iBooks course is a full-year endeavor geared towards helping people "design fully functional apps, gaining critical job skills in software development and information technology," according to Apple. Swift is Apple's open-source programming language that works across iOS, macOS, watchOS, and tvOS. In the fall, six colleges will begin teaching the iBooks material: the Alabama Community College System, Columbus State Community College, Harrisburg Area Community College, Houston Community College, Mesa Community College and the San Mateo Community College District. HCC is in fact opening an iOS Coding and Design School, Apple noted. "Select" high schools will simultaneously add it to their curricula, but Apple has yet to identify them by name. App Development with Swift is a part of Apple's broader Everyone Can Code program, which the company noted will see materials used in over 1,000 U.S. schools this fall. Encouraging Swift development likely has multiple benefits for Apple. In general it should foster the creation of more apps for its platforms, but in the long run it may also build up a potential workforce and further cement Swift and Apple platforms as a standard.